Ever had Minority Report car envy, or have day dreams of hovering to work in a saucer like George Jetson, well have we got news for you! 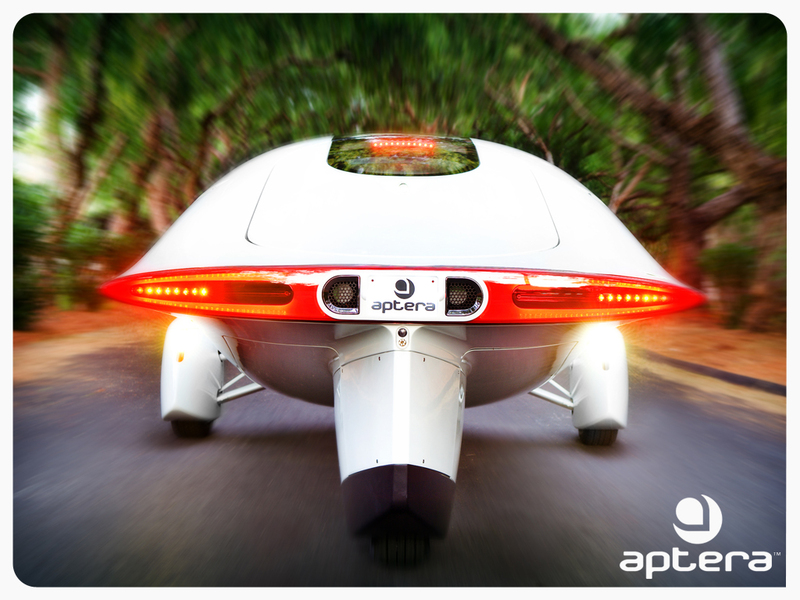 On November 19, 2007 Carlsbad-based Aptera announced that it is now taking fully refundable reservation deposits of $500 toward its all-electric vehicle that has stylings unlike anything the automobile world has seen. The three wheel vehicle (which based on its wheel layout and weight,is registered as a motorcycle) looks more like a household version of a passenger plane, or flying saucer, than a car. Its aerodynamic lines make it hard to believe that it won’t lift off at any second. The company hired the design firm, 'Eleven', led by Jason Hill and Nathan Armstrong. Aptera and Eleven made impressive strides by developing body styling, interior design, and structural engineering to maximize efficiency using CFD (Computational Fluid Dynamics). The company also developed and built advanced suspension and drive train components, and integrated a strong yet lightweight composite shell. The vehicle uses a small, water-cooled EFI Gasoline engine with closed loop oxygen feedback and catalytic converter that is coupled to a lightweight 12KW starter/generator. The result is a very clean and quiet ride, with an acceleration of 0-60 time in 10 seconds. But most impressive is that the car has an astonishing range of 120 miles, and its hybrid version will provide more than than 300 miles per gallon. The incredible vehicle is slated for release in 08’ and is sold at under $30,000. With its outrageous lines and tempting efficiency, it will be exciting to see the market response.